After the devastation caused to Puerto Rico after Hurricane Maria made landfall in September 2017, you might be hesitant to visit this spectacular tropical island in hurricane season. Even if a hurricane isn't as strong as Maria was, you could end up spending a few days looking out from your hotel room at a rain-soaked beach. For now, you can rest assured that Puerto Rico is back: The lights are on in San Juan, the airports are fully operational, and cruise ships are in San Juan Harbor. And there are plenty of hotel rooms to be had. 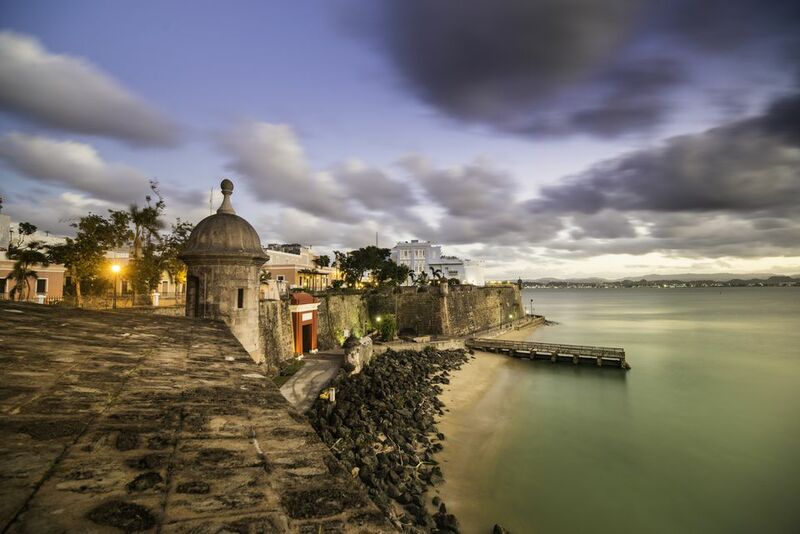 You can travel to Puerto Rico during hurricane season and as long as you stay aware of the weather, it might just be an excellent off-season destination. Hurricane season typically runs from June 1 to November 30 in Puerto Rico and throughout the Caribbean. This overlaps with peak travel dates during summer holidays for the kids and major national holidays like the Fourth of July and Labor Day. Hurricane season covers a long period of time, and while there is a risk of hurricanes throughout the period, most of the time the weather is fine. But because it's hurricane season and also because it's warm in the continental U.S. during these months, it's low season for Puerto Rico. Puerto Rico tourism is really two animals. The temperatures hardly change, but during peak season, from mid-December through mid-April, you'll pay premium prices for the lure of its near-perfect weather, with highs in the mid-80s F and lows in the upper 60s, and its tropical vibe. But in the off-season, you can find tremendous bargains at some of Puerto Rico's best resorts, and the temperatures are just a bit warmer, with afternoon highs averaging in the upper 80s and lows in the upper 70s. They know business is slow, and they’re prepared to offer a generous carrot to visitors. Sometimes these price drops are so drastic that you can get into a four-star hotel at a two-star price. It's not just that Puerto Rico is a far more crowded place in the winter months. Sure, the island is crawling with tourists from November to May, but that, in and of itself, isn't a bad thing. What's more of a problem during high season is the lack of availability of restaurants, hotel rooms, and activities. This is especially true of Vieques and Culebra islands. Because they are smaller, you'll find their best restaurants booked far in advance, hotels fully booked, and generally far poorer accessibility during high season. During hurricane season, you have a much better chance of getting a reservation in a hot restaurant or a room in your No. 1 hotel choice. And it is a true treat to travel to one of the island's beaches and find a secluded stretch of sand that is virtually your own for the day. That kind of exclusivity is much, much harder to get during peak season. During hurricane season, it highly likely that it will rain just about every afternoon during your trip. That's why it's also called the rainy season. But that doesn't mean your trip is a washout. There are plenty of ways to stay entertained in Puerto Rico during a downpour. The casinos are open no matter what's going on outside, barring a true catastrophe, of course. The restaurants are just as appealing, even if you might get a little wet getting there. And the old, walled city of San Juan can be enjoyable even in the rain if you can brave a few raindrops. Just take an umbrella. It's not all about the beach on this island. Hurricanes have devastating power and can destroy communities, let alone vacations. They cannot be ignored. But in Puerto Rico's case, you'll find that history indicates a few positives when it comes to storm damage. Hurricane Maria made landfall in September 2017 as a Category 5 and is regarded as the worst natural disaster ever recorded in Puerto Rico. It was the 10th strongest Atlantic hurricane on record. But before Maria, Puerto Rico had not been hit by a Category 5 storm since the 1930s. The last major hurricane to cause severe problems on Puerto Rico before Maria was Georges in 1998, which was a Category 4, and it was the first storm to directly impact the island since the San Ciprian hurricane in 1932. All things considered, you have to ask yourself if booking a vacation to Puerto Rico in hurricane season is worth the risk, but make sure you understand the risk. Of course, it doesn't take a major hurricane to literally dampen your holiday; if you are traveling during these months you might well experience days of rain. But when it’s not raining, the weather is just as warm, the sun just as bright, and the island just as gorgeous as it is during peak season when you pay peak prices. So check the forecast in the days leading up to your trip and plan for a great time. Like the postman, Puerto Rico tends to deliver at all times.